Purchase products from USYF and help kids! Most of the Midwest has been suffering through one of the coldest winters on record. If you live anywhere in the Midwest this isn’t news. But ways to make the most of the situation seem to be limited. Most of us are more than ready for the snow to melt and grass to grow. I agree. But since that is going to take at least a few more weeks, we decided to play the hand we have been dealt. We bundled up and went ice fishing with the kids. When I say “we,” I’m talking about our little four-member family. My husband and I have two great kids. TJ is 8, and Denali is 3. Both kids love just about every outside activity they have taken part in. Ice fishing is no exception. TJ ice fishes with my husband, Derrek, and Derrek’s friend, Rick, regularly throughout the winter. Denali and I have hidden in the warm house most of this winter. But this past weekend we could take the confines of the house anymore. Predictions for the end of this winter have ice remaining safe on lakes for several more weeks. So follow our lead and take the kids fishing. 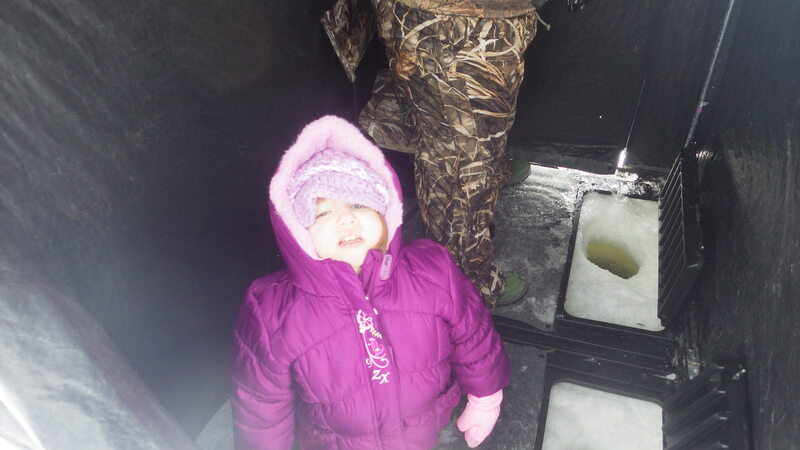 Here are some tips for making it as fun and educational as possible to go ice fishing with kids. Take some kind of shelter. Even when the weather at home seems perfect, the weather on the lake might be harsh. When we went this past weekend it was calm and sunny at our house. Once we got on the ice only about 15 minutes from home we were nearly blown by from the wind. But putting up a cheap portable shanty, we were able to take breaks from the gusts and stay warm. The kids spent less time in the shanty than anyone else, but it helped them warm up a few times when they otherwise would have been asking to go home. Brush up on your science. I’m not talking about taking a college-level biology course. I mean doing a little refreshing on the web. Look up the different types of fish you are likely to encounter and a few facts about them. Look up some interesting facts about the ice. These little bits of science can provide conversation starts with the kids that will help pass the time between bites. If you have kids that love video games and are you looking for ways to get them to go outside, I encourage you to make the transition easier by taking along some useful technology. Take your handheld GPS and mark the holes that delivered the best results. Grab an underwater camera like the Aqua-Vu Micro AV Plus camera. 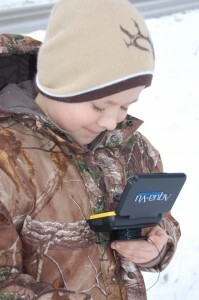 The small profile micro camera drops into the hole and lets you can the kids get a look at what is going on under the ice. Even between schools of fish, our kids enjoyed watching the plants and terrain under the water on the LCD screen. All that really matters about ice fishing is getting kids out to have some fun. What else are you doing to take advantage of this seemingly endless winter? This entry was posted in Fishing by Brandie Sigler and comments are closed.